Ready to start that personal blog? I see this question out there once in awhile. It’s a little bit of a departure for us here at GBW. Normally I write for people in business. Marketing folks. Business owners. Vice Presidents. Things like that. So we write about business blogging, but also online marketing, offline marketing, running a business and things like that. And I also mix in the occasional musing about life. Things that a little broader audience may be interested in. This one will probably fall into the latter. We’re talking about personal blogging. Which really can be for any reason. To get something off your chest. To get better at writing. Or it could be about exposing yourself to new opportunities. And that kind of fits into the business mindset a bit so maybe there is a correlation there. Anyway, if you want to start a personal blog (I’d say that it’s great to do so) but you don’t know what to blog about then here are some ideas. Let’s say that you’re really into golf. Or maybe traveling. Or maybe a sports team. Or maybe fantasy sports. Most people have at least one hobby. You can turn that love into a blog. 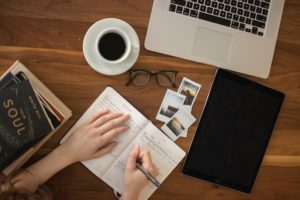 The great thing about one focus for a blog is that you’re likely passionate about it and that will give you an edge when it comes to keeping up with the blog. Because there will probably be a lot of months where you feel like you’re writing for yourself. That’s a challenge, but if you love the topic odds are good that you’ll push through. And you might already belong to a few communities where you know others that share the same passion. And you can share your initial posts with them to gain early feedback. Sometimes you can combine hobbies. My first personal blog was a combination of what I knew about hunting and marketing. I loved hunting. My job was marketing, which was also pretty much a hobby. So I wrote about how the two intersected. And I also threw a little country music in there as well. The intersection of things can be very interesting and you’re combining two potential audiences. Work is something we spend a lot of time doing in our lives. You might hate your job. That’s too bad. But maybe it would help to vent your feelings on a blog. Or maybe if your boss is holding you back creatively you can get your ideas out on a blog. Maybe that will even lead to better opportunities. Maybe you love your work. That’s obviously great too. You can take that energy and continue to use it even beyond the office or job site by writing about your work. You don’t have to be an expert at something to write a blog about it. I think it’s fascinating that many people are creating blogs or video series or podcasts on things they want to learn or that they want to be good at. I love golf. And there are video bloggers that want to be better at golf so they document their journey to improve. They meet up with coaches and play and all kinds of things. And in the process they improve and they also help others improve. I didn’t really know as much as I thought I did about hunting or marketing, but I started blogging about them and now I think I’ve improved a great deal at both since those early days. This is a big spectrum. It could be a significant other. It could be your immediate family or your extended family. Maybe it’s about your work relationships or about your friendships. Relationships are something that every human experiences. That’s a big potential audience for your new personal blog and it’s something that you probably have experience in and that you want to learn more about. One thing I’ve noticed recently when talking to people is that they have a need to teach. It’s gotta be programmed into our brains somewhere. We want to help others learn things. Well, you can do that with a blog. Very easily. There are no barriers or excuses. Just start teaching. Whatever the topic. You can reach and help all kinds of people. All over the world. This would be something you care deeply about. Maybe someone you care about was hurt in a mugging. You now care deeply about teaching others about the importance of self defense. We all have things that have affected us and those we love. We all have things we care about very deeply. Things we want to change. You can blog on that topic. It may just be a little bit of the change you want to have happen, but little change can have a big impact. There is a local movement going on in the US. Maybe even in other parts of the world. I’m seeing a lot of blogs and other really good publications popping up that focus on local happenings. There’s no reason you can’t become the go-to person for happenings in your area. Especially if you really love what’s going on in your area. Look at any local TV channel website or newspaper website. They’re a mess of ads. It’s a horrible experience. That’s a vulnerability that local bloggers can take advantage of. This is kind of the cliche that still exists around blogging. People sitting in their Mom’s basement just typing their journal thoughts everyday. Well, that’s not actually a bad way to go about personal blogging. It’s not the only way, but it’s definitely a good thing to do. There are lots of benefits to journaling. Think the Seinfeld Approach here. A blog about nothing, but kind of about the weird way that humans interact with others and with the world around them. Observational musings about what you see yourself and others doing. Personal blogging is a great thing to start. If you have the itch then I would definitely suggest going for it. What do you have to lose? Really there is nothing to lose. But there is potentially a lot to gain. I can’t say for sure what you could gain. For me it was a network of colleagues and a business and profession. I never thought that would happen. Even two years into blogging I had no idea. Hopefully the ideas above will help you get started. From there it’s about doing it regularly.